Maker of sweet earrings and happy accessories. Announcement PRICE CHANGE NEWS! Over the last 9 years I've only changed earring prices by fifty cents and the time has come to adjust my prices to reflect their current value. As of May 1 all earrings will go up in price to $7.50 per pair, $18 per set. Stock up before prices go up! I'm happy to say that in tandem with a price change I'll also be adding some exciting new options for earring lovers! New size options, clip ons and gold plated bases will be available as of May 1st. You'll be able to make your selection in a drop down menu at checkout. So many good things are coming! PRICE CHANGE NEWS! Over the last 9 years I've only changed earring prices by fifty cents and the time has come to adjust my prices to reflect their current value. As of May 1 all earrings will go up in price to $7.50 per pair, $18 per set. Stock up before prices go up! The colors are so pretty, and the size of the earrings are perfect. Fast shipping and Polly sent a free pom pom bookmark! I absolutely recommend this shop! One of my lady bunnies is having babies! In honor of precious bunnies everywhere I’ve listed these adorable white bunnies on blue. So precious! Spring is here! How cute are these gardening themed earrings??? Even if you can’t keep a fake plant alive, you can pretend to have a green thumb with these sweet garden forks and spades earrings. We won’t tell anyone, we promise. In December 2017 Polly Danger moved into a fantastic studio in downtown Portland, Oregon. 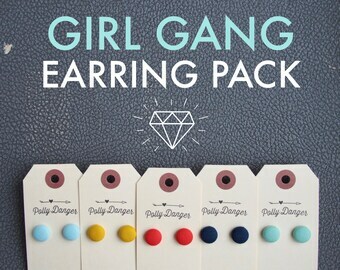 Polly Danger is a maker of button earrings, bow bookmarks, diy kits, and general small delights. I believe that like the colors of the seasons and the songs of birds are proof that beautiful things don’t need to be expensive. For me the loveliest things are the small ones, because they add up to a great big life of joy. I make very small things, but my hope is that they bring each customer a piece of their own great big joy. There is something so sweet about the anticipation of getting a package in the mail, something so lovely about waiting for just the right moment to open it (or not being able to wait at all), and something truly thrilling about the crinkle of a glassine bag as you hold it in your hand, oohing over the foggy treasure inside. Those moments are why Polly Danger exists. Polly Danger began in 2006, when I lived in San Francisco. I didn’t have much money to spend, but when I did have a bit extra, my favorite thing to do was buy chocolates or macarons from some of the lovely shops near my house. The colors and smells in the shop were part of the joy, and the sound of the bags was something I could carry with me as I took my treats home. The actual taste was the very final bit of pleasure and I savored it as long as I could. This was the very beginning, the very first kernel of what Polly Danger has become today; a shop full of very sweet, quite small pleasures that come to you in lovely, crinkly packages, to be savored and enjoyed as you see fit. Each item in this shop is made by me, Polly Danger. I take great pride in making beautiful treats that are meant to last the test of time while still being affordable to every size pocketbook. I'm Polly, a mover and shaker, maker of bows and button earrings, kits, accessories, tutorials and general cuteness. I'm headquartered in a crooked old house in a small town halfway between Portland and the rugged Pacific Ocean. Polly Danger is dedicated to bringing you the cutest possible accessories and home goods, Polly Danger puts love, ruffles, and sugar into every piece! All Polly Danger items are sewn tough and put to the sturdy test! They are meant to be loved and used for years to come- however if you feel you have received a faulty item, you may send it back to be fixed or replaced within 14 days of purchase. I currently only accept Paypal. All Polly Danger items are shipped first class, USPS within 5 business days of purchase. Please allow up to 2 WEEKS for delivery for all items. Your package will likely arrive in less than 7 business days, but please plan for a little extra time, just in case the U.S. mail gets bogged down, which happens from time to time. If you need your item sooner I am happy to upgrade your shipping to Priority Mail at your expense- just convo me! Please send me a message if you'd like international shipping on an individual item or a set of items and I will make a custom listing for you. Shipping rates are often more expensive that the merchandise itself, so I can no longer include international shipping as an option within the listings themselves. Thank you for understanding. Wholesale international orders are welcome. Please send me a message for a shipping quote. Wholesale orders- Polly Danger offers excellent wholesale prices on almost everything in the shop! Let me know which items you're most interested in and I'll send you a line sheet.